Bitter gourd has so many nutrients and its been used in the treatment of Diabetes. We have to include this veggie as much as possible in our Diet. But the main barrier here is the bitterness of this veggie. 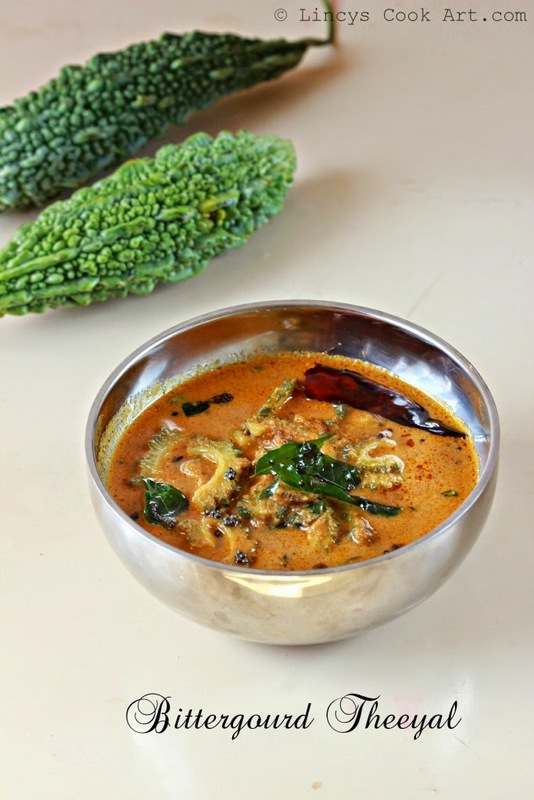 We can reduce the bitterness of this veggie by adding masalas and tamarind water which absolutely reduces the bitterness and gives and heavenly taste to the dishes. In South India each state has its own Bitter gourd preparation using tamarind and masalas similar to this. In Tamil Nadu they call as Kara kuzhambu. Similar to that in Kerala we use roasted coconut and maslas to prepare this yummy dish. In a pan roast the coconut, onion, jeera till you get the dark golen colour. Add little oil if needed. Heat oil in a pan and add the bitter gourd and saute in oil after a minute sprinkle some salt and cook till the cut edges of the bitter gourd brown lightly. Now add the ground coconut paste and mix well. Add half to one cup of water to dilute the curry. Bring it to boil once the curry stats to bubble, add the tempering and switch off the gas. I love your Kerala recipes. They look so tempting! This pavakka theeya looks so good and tempting..